If you've been reading New Girl in Toon for a few years you'll know that on 29 May each year I write a blog post celebrating another year of being at my goal weight, and if you're new then you may not know that 6 years ago today I completed my mission to lose 9 stone and reach my healthy weight (read my story here). 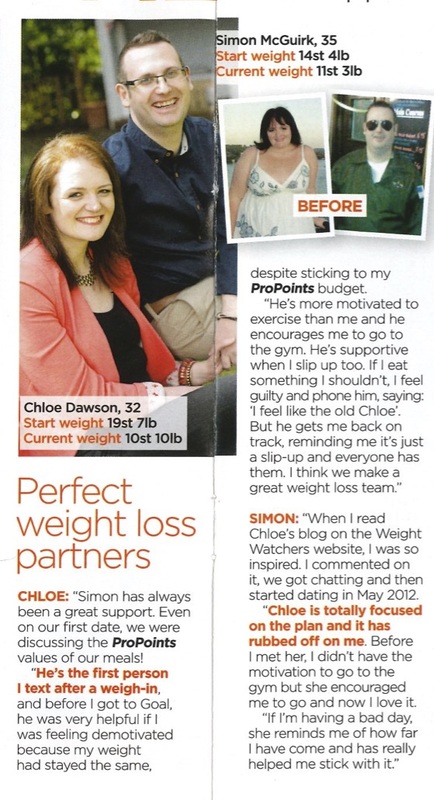 Today I've decided to share a very special memory from the very first few months of my relationship with Simon, the day that we became Weight Watchers Campaign Stars! 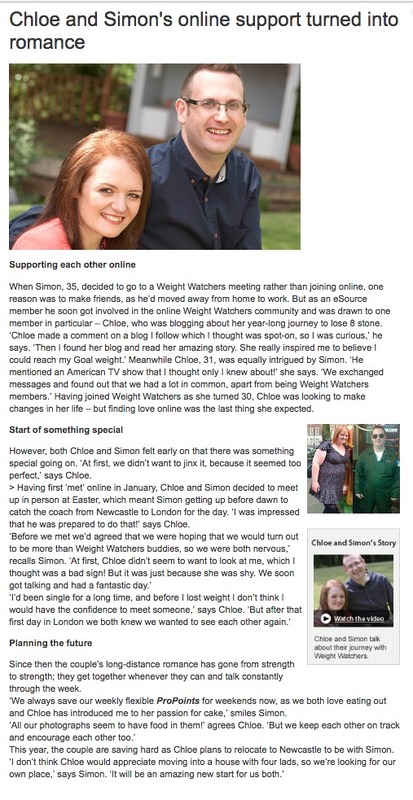 Simon and I met through the Weight Watchers online community. I was living in London, he was up in Newcastle and we read each others weight loss blogs and fell in love whilst helping each other on our weight loss journeys. When we met I was a few months off reaching my goal weight and his support was vital to me completing my journey. It's no surprise that Weight Watchers heard about our romance, I mean it's not every day you lose 9 stone and fall in love (doesn't that sound like a heading from a cheesy real life article in a trashy magazine?) and a few short months into our relationship they got in touch with us and asked us if we'd like to head down to Surrey for a photoshoot and to share our story. We accepted immediately! Simon and I were only getting to spend time together every few weeks so being able to see each other much sooner than we'd originally planned whilst getting spoilt by a wardrobe team and makeup artist sounded too good to be true. Looking back at it now, the Weight Watchers shoot was probably only the 6th or 7th time we'd met each other, I'm not sure many couples can say that one of their earliest dates was being interviewed about their relationship! Our day with Weight Watchers began with a wardrobe styling. I was taken into a room with rails of gorgeous clothes to try on. Still getting used to my new body shape it was such a great opportunity to have some one on one time with a stylist who pulled out some fantastic outfits that I never would have thought to try on myself. It's pretty crazy but when you lose a lot of weight it takes a long time for your head to catch up with your body and in the mirror I always saw size 20 Chloe looking back at me and when I held up something in a size 10 it looked super tiny and I just couldn't understand how my body could ever get into it. I was still very much hiding behind baggy clothes and attending the photo shoot with Weight Watchers made me discover my waist. 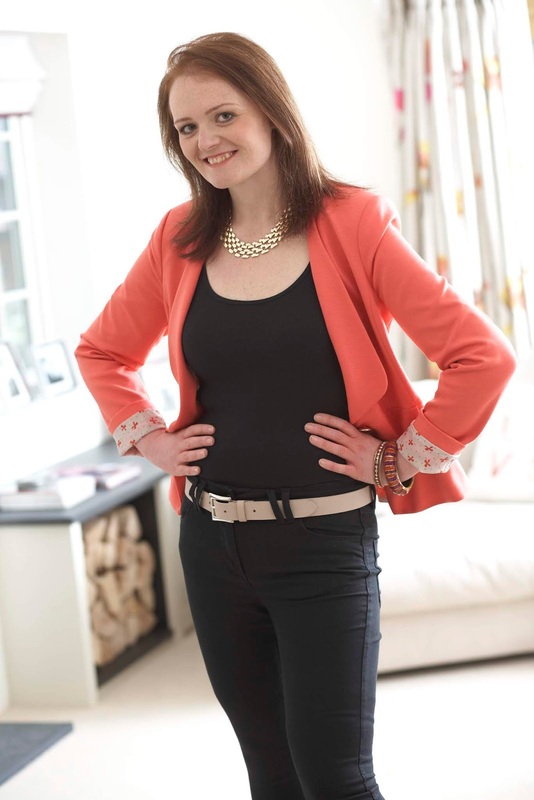 Dressing in skinny jeans for the first time was quite a moment and when I was given a bright orange jacket to wear I just couldn't believe it was me! 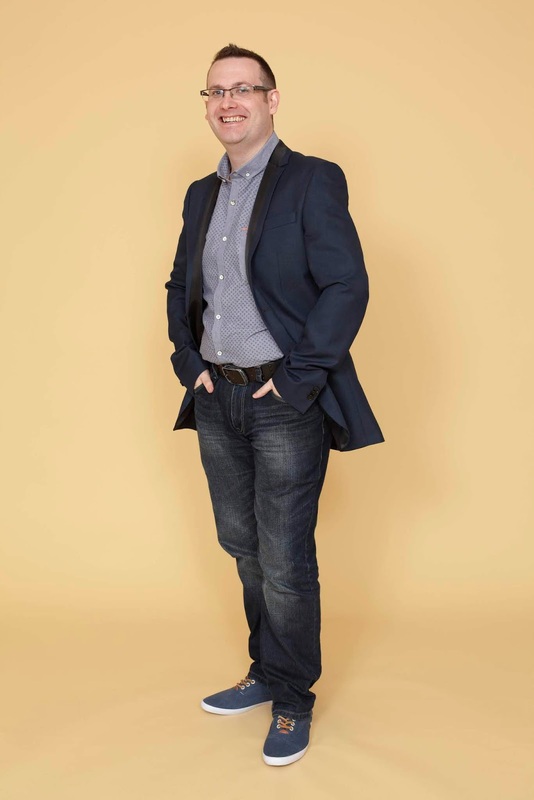 I can't say that posing for photos came naturally to me, having spent so many years hiding in the shadows embarrassed by the way that I looked parading about in front of a camera felt a tad awkward but the Weight Watchers team were so great at making me feel very comfortable and making sure that I was happy. My second outfit was a gorgeous pink salmon top that I wore over some black leggings and the most beautiful glittery heels! This outfit will always stick in my mind as I stumbled my way down the stairs in those shoes to do my photos, Simon was waiting for me at the bottom. It was the first time he'd ever seen me dressed up and he just couldn't stop paying me compliments. In those early days of our relationship I was so shy I'm pretty sure I just went bright red and changed the subject but every time I see these photos I'm reminded of his face when he saw me. As well as doing some photos we were also sat together in the lounge to make a short video. Luckily it's no longer online so I can't embarrass myself and share it with you, it involves a lot of me blinking as I was trying not to cry. To this day talking about how much Weight Watchers helped me makes me a little emotional - for the video I had to talk about how Weight Watchers had changed my life and I just couldn't get my words out in any kind of coherent sentence without the tears coming. I was so overwhelmed and thankful to them for not only changing my life but for introducing me to Simon. Things went a little quiet for a while after our photoshoot until one day, out of the blue, we were contacted by a journalist for Weight Watchers who wanted to interview us both as they were ready to run our photographs as part of their 2013 Valentines Campaign. By this time we were busily saving so that I could afford to leave London and join Simon up in Newcastle. 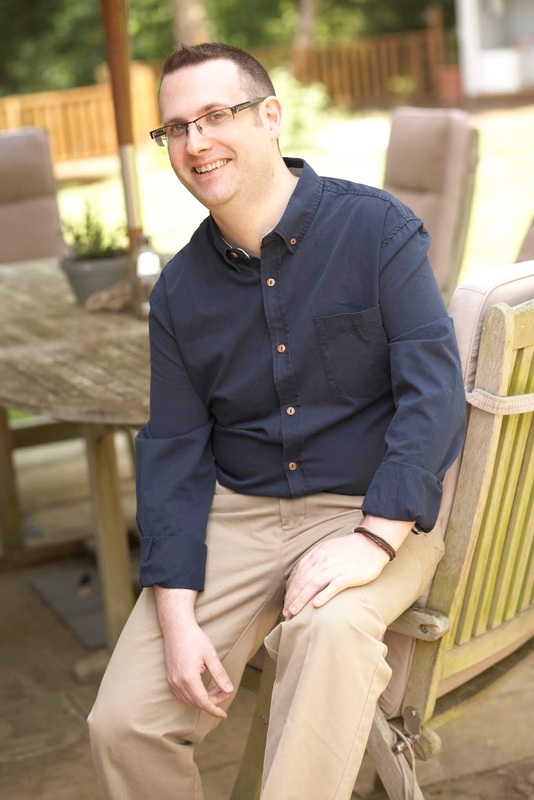 Things had got serious very quickly and by the time our Weight Watchers campaign launched our relationship was 10 months old and we were ready to take a huge step to be together. Seeing our faces pop up on the Weight Watchers website was funny and when it got shared on their Facebook page we were overwhelmed by the support and love from our family and friends. and we couldn't believe it when our story was also shared in the booklet that was handed out at the meetings! It was our five seconds of fame and it was a pretty special feeling and definitely something to keep to show the grandkids one day! Sitting here now all these years later it seems so funny that Simon and I shared an experience like this so early into our relationship and that we ended up getting married. Sometimes I have to pinch myself to realise that all of this happened to me. It is absolutely crazy! Has anyone else ever had 5 seconds of fame? I'd love to hear your stories! Congratulations of 6 years at goal, that’s no mean feat! I’m pleased you’ve found something that works for you. I think out of all the diets I’ve seen, weight watchers is a great plan. I love that their new plan takes into account sugar and protein, it really encourages people to make healthier choices that calorie counting wouldn’t. Well done. It is a huge achievement and truest inspirational. You’ve both decided to hit a goal and hit there. Thank you, yes staying there is definitely much harder than getting there! Writing up this blog was the first time I've dug them out in a few years and it was so lovely looking back - such great memories! I had no idea this was how you guys met! What a lovely story, I’m super impressed that you’ve maintained your weight for 6 years too, it must be so difficult! OMG how funny! She may well have done!